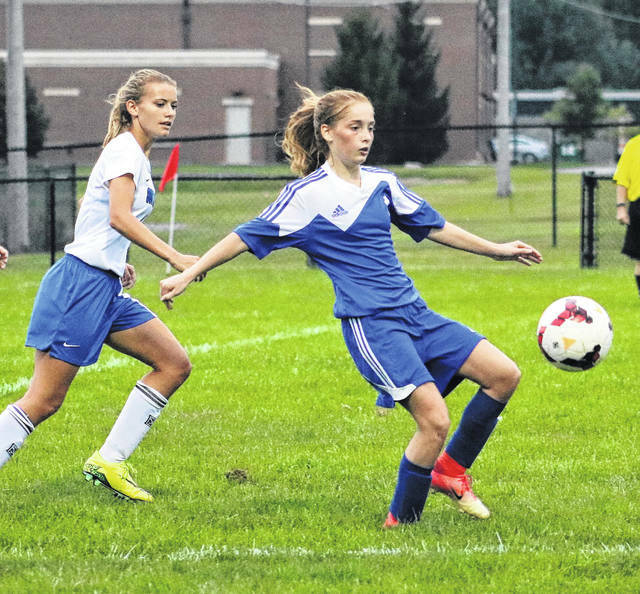 Chloe Lovett, above right, scored the first goal of the season for Washington during a non-league match against Southeastern Thursday, Sept. 6, 2018 at Washington. The Washington Lady Blue Lion soccer team hosted the team from Southeastern High School (Ross County) Thursday, Sept. 6. Washington has had a tough go of things so far this season, entering the game looking to break a scoreless streak through the first five games. Southeastern won the game, but, the good news is, Washington broke through with three goals (the final score was 5-3). Chloe Lovett scored the first goal of the season for Washington on a breakaway. Kassidy Hines converted a penalty kick and the final goal was scored by Mackenzie Shaffer. “The team saw what they could be,” Washington first-year head coach Chris Chambers said. “The first half was the best they have played all year. Washington is at Jackson Tuesday and home against McClain Thursday.